Crape Myrtle: Colorful Blooms for your Late Summer Garden! After many years of hybridizing and the production of more cold hardy varieties, Crape Myrtle (Lagerstroemia indica) can be successfully grown here in the Northeast. These showy trees are a personal favorite of mine due to their beautiful long lasting blooms that start at the end of the summer and last well into Fall, a bloom period of approximately 120 days! Just as other flowering trees and shrubs are reaching the end of their bloom cycle the stately Crape Myrtle ‘Lagerstroemia indica’ starts its spectacular show. I often use these beautiful trees as an eye catching element in my designs as they serve nicely as an anchor plant in a foundation planting or as a focal point in an island bed or backyard garden. There are many varieties of this beautiful tree ranging in size from ‘Pocomoke’ and ’Chickasaw’, which are dwarf varieties, topping off at approximately 5 feet to ‘Natchez’ (White),‘Tuscarora’ (Coral Pink),‘Muskogee’ (Lavender) and ‘Catawba’ (Purple) ranging at a height between 12-20 feet. A personal favorite of mine is Crape Myrtle ’Sioux’, a medium variety that ranges in height to approximately 12-15 feet. The medium-pink flowers of the ‘Sioux’ Crape Myrtle begin late in July and last well into October and are an elegant display not to be missed. Three other varieties of Lagerstroemia worth mentioning are ‘Tonto’ and ‘Dynamite’, both known for their vibrant red flowers and medium height of 12-15 feet and ‘Zuni’ (Purple) at a smaller 8-9 feet in stature. HARDINESS AND GROWING CONDITIONS: Lagerstroemia are a hardy to zones 7-9 and are “deer resistant”, meaning that deer will most likely avoid them in their diet. They grow best in full sunlight in a well-drained soil with a pH of 5.0-6.5. These trees require little to no pruning but can be pruned to maintain a more compact shape or to remove any dead branches that may result from a harsh winter. If you are going to prune wait until late winter or early spring after the last frost. The plants are dormant in winter and any flowering occurs on new growth so pruning will encourage new flower producing branches. Remove any dead branches, suckers growing from the base or weak twiggy branches and allow strong leader branches to keep the framework of the tree. TRANSPLANTING: If you are planning on transplanting your Crape Myrtle tree the best time to transplant in the northeast is in mid April or mid September through mid October. Roots need time to become established before the summer heat or winter cold set in. Dig a hole slightly wider than the root ball and make sure the tree sits at the height of the surface or slightly above. Apply a layer of mulch around the tree to protect the roots and keep well watered until established. Crape Myrtle are somewhat sensitive to cold so there may be some branch die back in the first season until the plant becomes well established. Depending on the preference of the grower Crape Myrtle can be planted as either a multi-trunk or singular-trunk form and can be displayed as either a shrub or tree in the landscape. An important note worth mentioning is that Crape Myrtle (Lagerstroemia) are among the last plants to push out their new growth so if they appear to be dead at the end of winter going into spring just give them some time to come into their glory. Since they are later to push out their leaves they do benefit from an early spring feeding of a high phosphorus-lower nitrogen 5-10-5 formula to promote good foliage growth and an abundance of blooms in July-August. Crape Myrtles are not susceptible to insects or disease but as in any landscape planting they should be monitored and properly maintained to keep them in good health. If you are looking for a long blooming, deer resistant, low maintenance tree to add color to your garden then Crape Myrtle may be the tree for you. I for one would highly recommend this beautiful plant as a welcome addition to any formal or informal landscape. Book Announcement! My First Published Book! After two years of working on my book I am excited to announce that it is finally published! A Guide to Northeastern Gardening: Journeys of a Garden Designer is a comprehensive guide to gardening in plant hardiness zones 3-9. My goal for the book is to share information on a number of gardening topics based on my experiences as a landscape designer over the years. A Guide to Northeastern Gardening is a comprehensive guide of valuable information on plants hardy in a range of zones from 3-9, and gardening techniques backed up by my own personal experiences as a professional landscape designer, along with answers to frequently asked questions. Learn about landscape design principles, butterfly gardening, deer resistant plants, long blooming perennials, globe and weeping evergreens, flowering trees and shrubs, native plantings, shade gardening and more. Whether you are a novice or experienced gardener, A Guide to Northeastern Gardening will help you to create your own dream garden. Come along on my journey into the world of gardening! 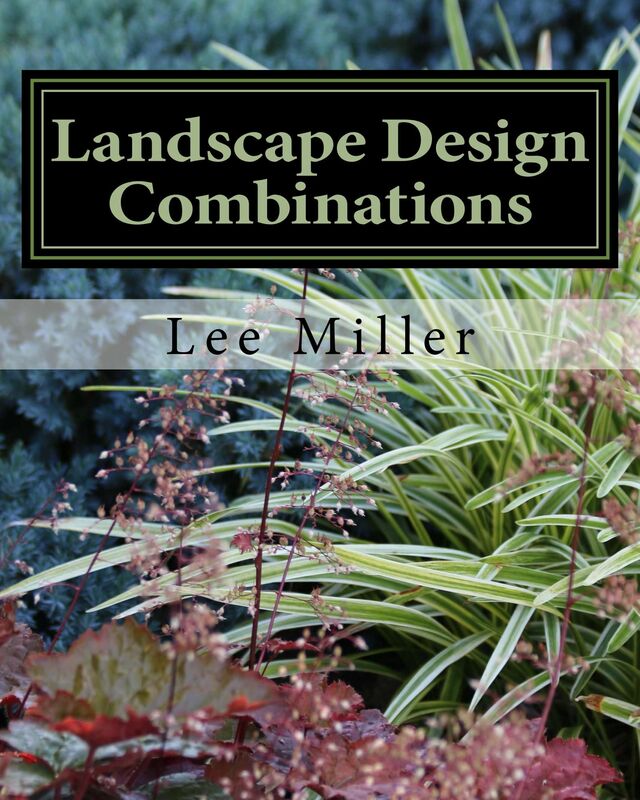 Lee Miller is a professional landscape/garden designer involved in the horticultural industry since 1996. Having started a gardening blog in 2010, she is the author of over 150 articles on general gardening, landscape design principles, gardening tips, planting, pruning, garden maintenance, feature plants and more. 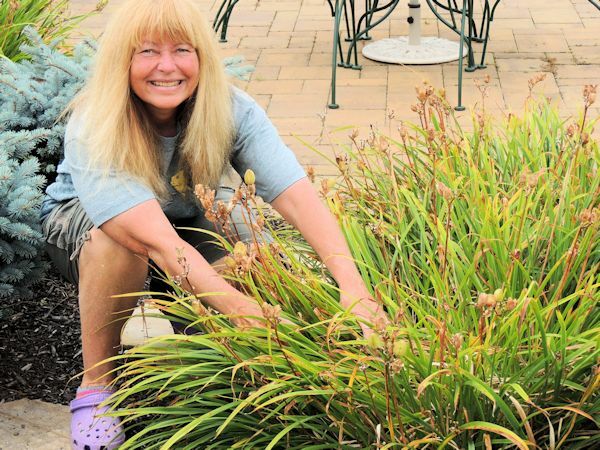 Her published book, “A Guide to Northeastern Gardening”, is an accumulation of information touching on a wide variety of gardening topics, all backed up by her own personal experiences. Updated for 2016: Now in Amazon Softcover! Also here is a link to the full story behind the author and the book. I hope to share my gardening experiences with you! As winter settles in here in my Zone 7, Long Island garden I look out upon the landscape and access how certain plants have performed over the years as far as hardiness and maintenance are concerned. In winter when structure is extremely important the Sweet Flag tends to stand out. Golden Sweet Flag (Acorus gramineus ‘Ogon’) may not be a plant I regularly use in my designs but it does have its merit in the landscape and looks perfect when in the correct spot! Sweet Flag is hardy in USDA zones 5-11, prefers to be grown in partial to full sun and requires a constantly moist soil. It clumps to approximately ten inches tall and slowly spreads by underground rhizomes. 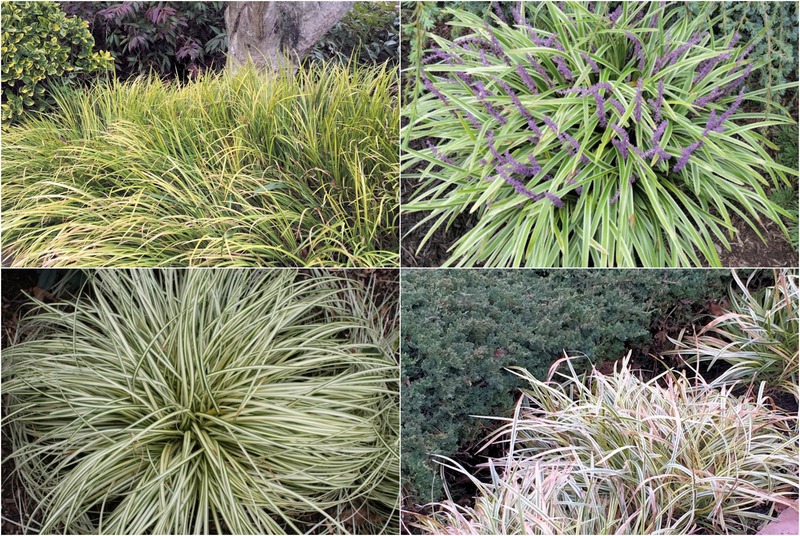 Alternatives to Sweet Flag are Carex oshimensis ‘Evergold’,Variegated Japanese Sedge (Carex morrowii ‘Aurea-variegata’) and Liriope. Evergold and Variegated Japanese Sedge each grow to about the same height of 10 inches to a foot and stay in more of a clumping form and Liriope (Liriope muscari ‘Variegata) grows to approximately 6-12 inches in height, also stays in rounded clumps and bears small purple blooms in fall followed by black berries. Liriope prefers dry shade but will adapt to just about anywhere. All three are considered “deer resistant” and I frequently use each in my designs. Next time you are looking for an evergreen, shade tolerant, moisture loving perennial consider Sweet Flag. This seemingly underused plant could serve nicely in your landscape when given the correct location! As Always…Happy Gardening and all the Best for the New Year! Spring is approaching and soon it will be time to get back into the garden. 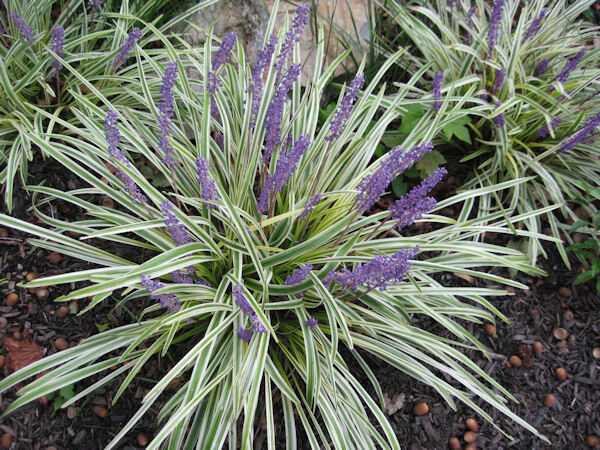 One of the most versatile perennials I have known over the years is variegated liriope (Liriope muscari ‘Variegata). Also known as Lilyturf, this cultivar has a grass-like appearance and grows in neatly rounded clumps which do not spread aggressively like Liriope spicata. Liriope ‘Variegata’ is cold hardy in USDA zones 5-10, grows in full sun to shade and will tolerate a range of conditions from moist soil to drought conditions. 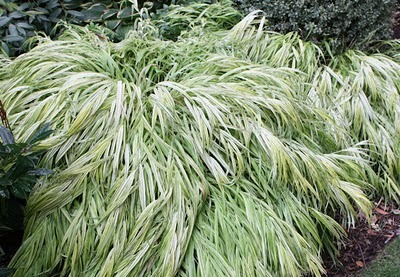 It grows to a height of 12-16 inches and is mainly evergreen displaying cream and green variegated foliage. Showy flower spikes of deep lilac blooms resembling grape hyacinth emerge in late summer and last into fall followed by dark berries which persist into winter. Liriope is adaptable under pine and walnut trees and is excellent when used as a ground cover or border. It is also widely used for erosion control, considered to be rabbit and deer resistant and is drought tolerant once established. This versatile plant fits well into just about any type of garden from informal to formal and is very hardy and reliable in performance year after year. Liriope is completely evergreen in warmer climates and is semi-evergreen here on Long Island. It can be cut back part way in fall or left until spring to be pruned. If browning occurs over winter simply cut back in early spring to allow for new growth to appear. Variegated liriope is easy to grow, fairly disease resistant and will provide interest to your garden all year round. It will prove to be a dependable and versatile addition to any landscape. Ornamental grasses and various varieties of sedge are often used in landscape design in order to add grace and movement to a garden. There are a vast variety of plants to choose from so I will discuss a few of the more popular and widely used species that are all hardy in zone 7. Ornamental grasses and sedges can fit into a variety of landscapes including foundation plantings, poolscapes, perennial borders, rock gardens and naturalized settings, and as an added bonus, most are also deer resistant. Dwarf Fountain Grass (Pennisetum alopecuroides ‘Hameln’) is an attractive dwarf grass growing to 2-3 feet in height and hardy in zones 4-11. ‘Hameln’ requires full sun and prefers a well-drained soil. It is drought tolerant once established. It is known for its wispy green foliage in summer and golden-rust foliage and fluffy, buff-colored plumes appearing in fall. ‘Hameln’ works nicely along with evergreens or flowering shrubs in a foundation planting or as a backdrop in a perennial bed. There is even a smaller sized variety of this grass called ‘Little Bunny’ which grows to only 1-2 feet in height and width for tighter areas. 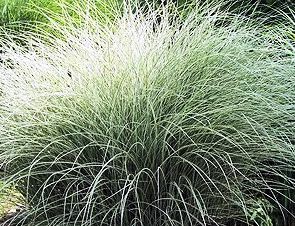 The grass is almost identical to ‘Hameln’ only the foliage and plumes are on a slightly smaller scale. Miscanthus sinensis ‘Yaku Jima’ is a hardy ornamental grass in zones 5-8 and grows to 4-5 feet in height. It requires full sun and is drought tolerant once established. ‘Yaku Jima’ serves nicely as a backdrop in a perennial border or in a privacy screening. It also looks beautiful in a poolscape or pond planting. The beauty of this dwarf version of traditional Miscanthus is that is does not become top-heavy and flop over but rather remains upright throughout the season. .
Miscanthus sinensis ‘Morning Light’ is another form of upright grass with narrow green foliage edged in creamy-white. It is hardy to zones 5-9 and requires full sun to partial shade and grows to a height of 4-6 feet tall by 3 feet wide. Coppery-pink plumes emerge in fall. ‘Morning Light’ also serves nicely in pool settings and perennial or privacy borders along with evergreens. The variegation contrasts nicely with an evergreen backdrop. Hakonechloa macra ‘Aureola’ (Golden Japanese Forest Grass) is one of the most attractive of the ornamental grasses and one of the few that prefers to be grown in shade Hardy to zones 4-9, Hakonechloa forms mounds of bamboo-looking grass growing to 6-8 inches tall by 12-18 inches wide. Japanese Forest Grass prefers a moist loamy soil and serves nicely in an informal setting such as a garden border or shade garden. 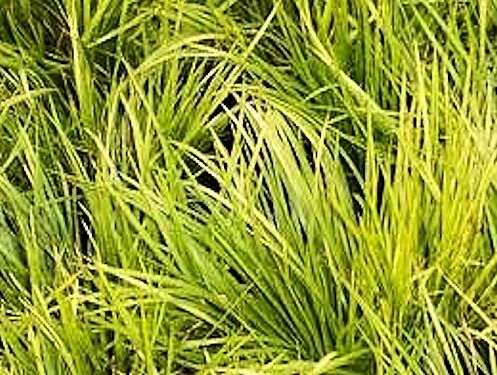 Carex oshimensis ‘Evergold’ (Variegated Japanese Sedge) is a grass-like Japanese selection forming low clumps only 6-8 inches tall by 9-12 inches wide. It prefers to be grown in part sun to full shade in a moist, loamy soil. 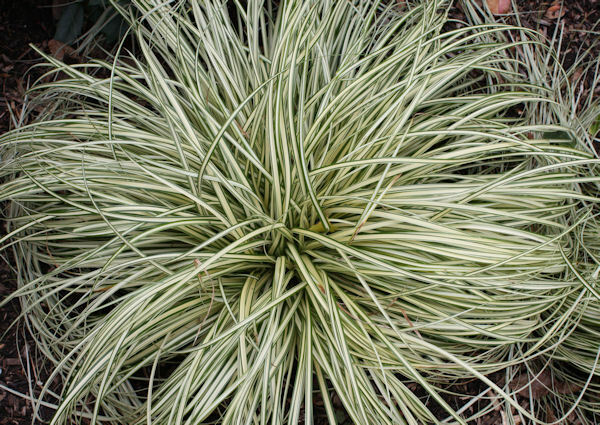 Carex ‘Evergold’ is hardy in zones 5-9 and displays a green-yellow variegated foliage. It serves nicely in a rock garden, foundation planting or perennial border. 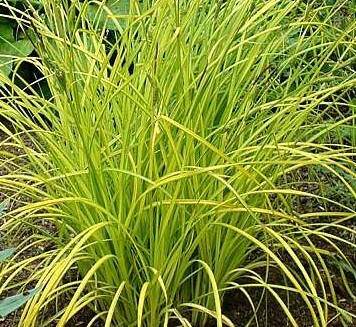 Carex ‘Aurea’ is another form of Carex displaying golden foliage and growing to a height and width of 2-3 feet. This Carex is hardy in zones 5-9 and prefers full sun to partial shade a moderately moist soil. Glowing yellow foliage has an edging of green and forms dense upright clumps which fit nicely into pond settings and in shady areas. 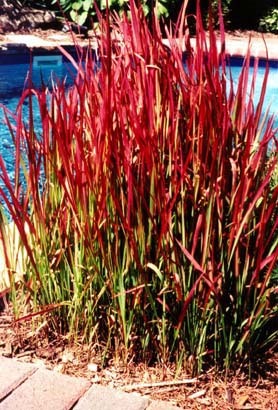 Imperata cylindrica ‘Rubra’ (Japanese blood grass) is often used in naturalized areas displaying its bright red-green foliage. 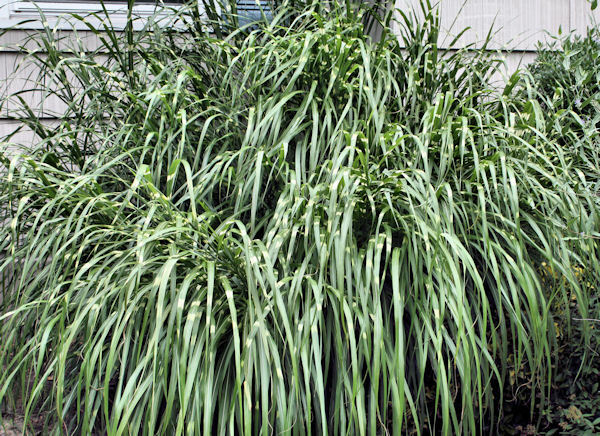 Japanese Bloodgrass grows to a height and width of 12-18 inches and forms clumps that spread by rhizomes. It is hardy in ones 5-9 and prefers full sun to partial shade and a well-drained soil. This species of ornamental grass can spread easily so plant in an area where it can be controlled.such as the pool planter shown above. Acorus gramineus ‘Ogon’ (Golden Variegated Sweet Flag) is not a true grass but has a grass-like appearance growing in dense upright mounds of bright golden foliage. Sweet Flag is hardy in zones 5-11 and prefer to be grown in partial sun to dense shade in a moderately moist soil. Mature size is 8-12 inches high by wide and Sweet Flag serves nicely in a pond setting, rock garden, or foundation planting as a ground cover under the canopy of trees. The last grass, Miscanthus sinensis ‘Zebrinus’ (Zebra Grass) is known of its striking horizontally banded foliage. Golden-yellow bands on green fronds are displayed on this larger upright clumping grass that reaches a height and spread of 6 feet and up to 8 feet tall with plumes. Miscanthus sinensis ‘Zebrinus’ prefers to be grown in full sun to partial shade in a well-drained soil and is hardy in zones 5-9. 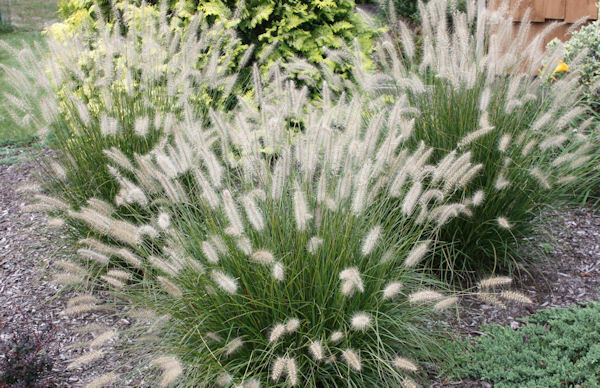 Tiny pinkish-copper tassel-like flower heads form in late summer, gradually turning into silvery white plumes in fall. Flower plumes persist well into winter providing good winter interest. This plant serves nicely in an informal beach-like or coastal setting. 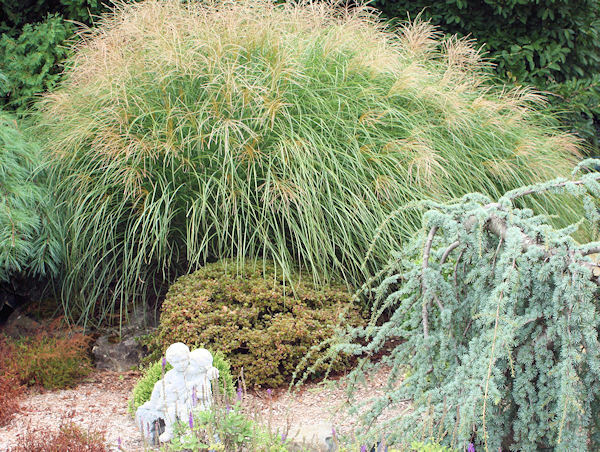 Depending on your landscape, ornamental grasses can add wonderful all-season interest to the garden and serve a variety of functions. There are so many varieties of sizes and foliage to choose from that they can fit into just about any type of setting.